The best recipe for Chicken Pot Pie. A delicious and nutritious pie filling which contains carrots, peas, beans and corn and all wrapped up in a buttery, flaky pie crust. 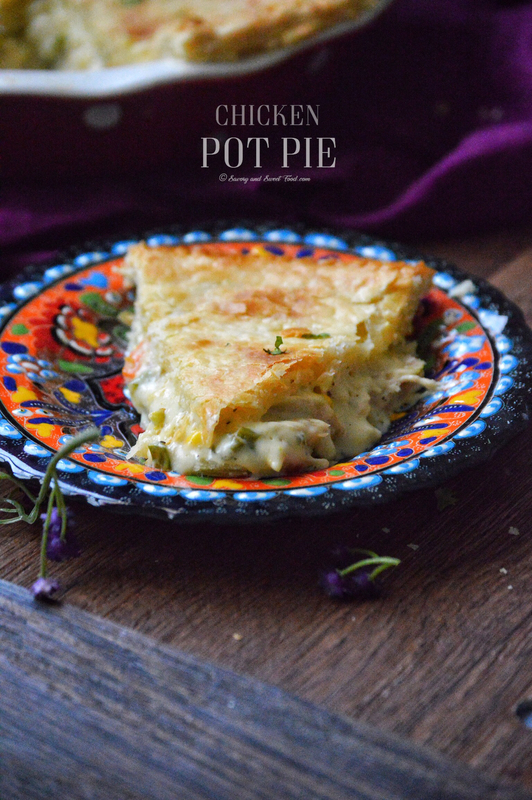 I have been trying to share the recipe of this Chicken Pot Pie on the blog for months. I have made it so many times because obviously it is a family favorite and also because I wanted to share the recipe with you all. But for some reason, everytime I think of shooting the pictures of this pie something or the other goes wrong. Either the filling gets too loose, the crust gets overbaked or the photos turns out dull and uninviting. Even this time, I am not very impressed with the clicks, but I thought I better post it now or it will never happen. I have made this pie using readymade Puff Pastry crusts twice before and it was really good. But if I have the time, I would always prefer a homemade pie crust over puff pastry any day. This pie crust is the most flaky and tender crust you can ever imagine. The filling is like a thick and flavorful creamy soup with lots of veggies and chicken. You can add any vegetables you like. I have used carrots, beans, peas and corn. You can add potatoes, or broccoli or any other veggie you prefer. Hope you and your family will enjoy this simple, classic homemade dinner. If you want to use puff pastry, thaw the puff pastry by keeping it at room temperature for 1 hour or by defrosting it overnight in the refrigerator. If you’re using square puff pastry, then stack up 4-5 pastries and roll it into a sheet. Fold it carefully and refrigerate. This pie freezes very well, it can be frozen for up to a month in the freezer. Combine flour, sugar, and salt in a large bowl. Add the cubed butter and mix well till the butter is nicely incorporated into the flour. The mixture will be flaky. Place the bowl in the freezer for 15 mins to chill the butter. Remove from freezer and add buttermilk to it. Mix well with a spoon. Use your hands to lightly knead and bring together the dough until it forms a ball. If the mixture is too dry, add in water a tbsp at a time. Divide the dough into two and flatten into disks. Wrap each disk in plastic wrap and chill in the refrigerator while you make the filling. Marinate the chicken with salt and pepper. Heat 2 tbsp of butter in a pan. In the same pan add in the onions and sauté till translucent. Add in the beans and carrots. Add a little freshly cracked pepper. Sauté till slightly soft. Add in flour. Mix and cook for a minute on low heat till the raw smell disappears. Pour in the milk and bring it to boil stirring constantly. The sauce will start becoming thick. Add in the frozen sweet corn and green peas. Pour in the cream and add chicken stock cube. If you want to make it spicy, add slit green chillies at this point. Mix well. Add freshly cracked pepper. Check for salt and add if needed. Simmer for 2 minutes. Add parsley and turn off heat. Remove the pie crust from he refrigerator. Transfer the dough into a 9” pie pan. Brush egg around the rim of the pan so that the pastry sticks well. Fill pie with filling. Roll out the second disk of dough and carefully cover the pie. Seal the edges by crimping with a fork or your fingers. With a sharpe knife , make few slits on top of the pic crust. Bake for 45 minutes or until the crust turns golden brown. Make sure that the bottom crust is well cooked too. If you're using square puff pastry, then stack up 4-5 pastries and roll it into a sheet. Fold it carefully and refrigerate. How much would one cup butter be approximately? 1 cup butter would be 227grams Nidha. 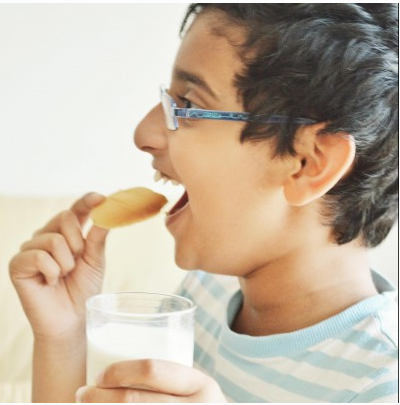 Which brand buttermilk did you use? I use Al Marai fresh laban. how can we substitute buttermilk?